Chase Ultimate Rewards is a great program with many fans. Just like the American Express Membership Rewards and Citi ThankYou programs, Ultimate Rewards offer multiple ways to redeem points. It is the only program that allows easy cash redemption at 100:1, but it mostly shines on travel redemptions. If you like to travel, you might want to avoid some common mistakes in order to stretch your dollars. These mistakes are easy to make because the Ultimate Rewards earning structure is a bit complicated. There are currently five credit cards that earn you Ultimate Rewards points. All of them are good in their own way. Chase Sapphire Preferred is a premium $95-a-year card that started it all. It earns 3x on directly booked airline tickets and 2x on travel and dining. It also lets you transfer points to airline and hotel programs and offers a 25 percent bonus on booking travel at the Ultimate Rewards web portal. Chase Sapphire Reserve is the most expensive and the most beneficial credit card in the Ultimate Rewards line up featuring 3x on travel and dining. It also lets you transfer points to hotel and airline programs and offers a whopping 50 percent bonus for booking travel on the Ultimate Rewards website. It has other terrific benefits for the annual fee of $450. It is the latest UR offering. Chase Ink Plus is a $95-a-year business credit card with 5x earning on office supply, as well as internet, phone and cable TV bills. It also features 2X on directly booked hotels and offers same premium benefits as the Sapphire Preferred. Chase Freedom is a no-annual-fee card with 5 percent quarterly bonuses. There are no additional travel perks so you will need at least one premium card to maximize the program’s benefits. Chase Freedom Unlimited is also a no-annual-fee card with 1.5x on everything.There are also no additional travel benefits unless you pair it up with a premium UR card. You will benefit from using at least one premium and one or two regular Chase cards to maximize your earnings. While we generally recommend transferring points to an airline to take full advantage of the program, that’s not always the case. There are times when using points to book your flight on the website is a better idea. Remember that you can always get $1 for 100 points by cashing out, so you only want to transfer to an airline when the miles can get you more than a penny per point. All major U.S. frequent flyer programs, like United, charge 25,000 miles per roundtrip, which means you will need to transfer 25,000 points to an airline program in order to book your flight on miles. So, with the 25 percent and 50 percent bonuses, you might want to use this option only if your ticket costs less than $300 (with Sapphire Preferred) or $375 (with the Sapphire Reserve) on the UR website . Otherwise you’re better off booking your travel for points at the portal. Here is an example. 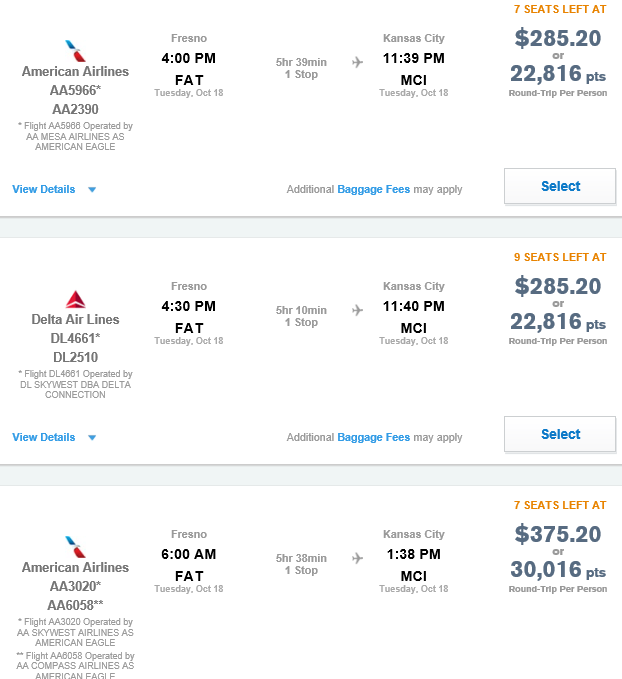 If you want to fly between Fresno and Kansas City on October 18-22, your cheapest fares on the Ultimate Rewards website will be 22,816 points with the Sapphire Preferred card show below or 19,013 points with the Sapphire Reserved. In the meantime, should you book the same flight on the United website, it will come up with a higher tag of 25,000 miles and $11 in taxes (all fares quoted on the Ultimate Rewards website already include taxes and fees). There are two more reasons why booking for points might be better or/and more convenient. 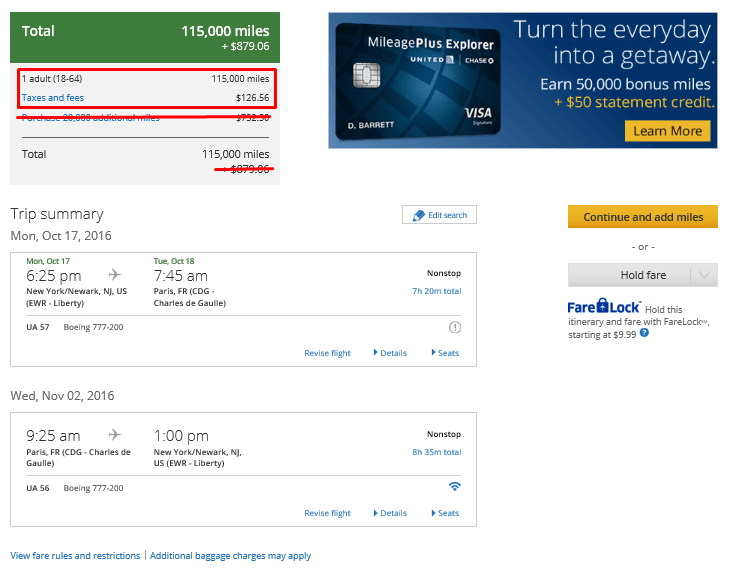 Mile redemptions aren’t always available for the Saver (cheapest) award. If you want to redeem miles, you often need to be flexible. When you book flights on the Ultimate Rewards website, you usually earn the airline miles. When you redeem your award ticket with an airline, you don’t. Flights that cost considerably more than $300/$375 are never a good deal on the Ultimate Rewards website, providing that you can find a Saver rate availability for your desired dates on the airline website. 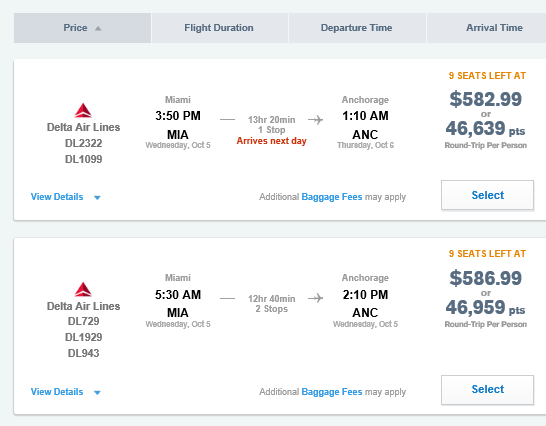 Consider a flight between Miami and Anchorage, which, for our dates would cost you 46,639 points with the Sapphire Preferred (shown below) and 39,133 points with the Sapphire Reserved. 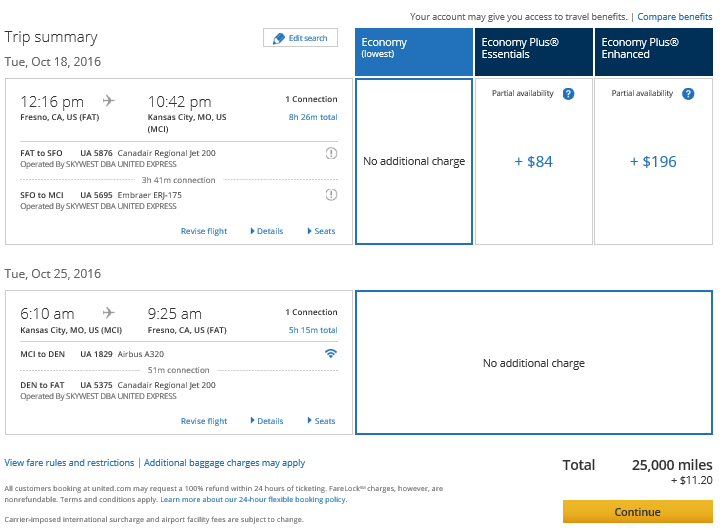 The same flight would only run you 35,000 United miles and $11 in taxes (ignore the close-in $75 charge, as you won’t need to pay it if you book more than 21 days in advance). That means you will get to save from 4,000 points to over 11,000 points by transferring them to United and booking with miles. Always verify availability before transferring the points. You can transfer them to United while you’re on the call with a ticketing agent as United transfers are usually instant. Unless you’ve found a bottom-bargained point price for a business or first class ticket on the Ultimate Rewards website, always transfer your points to an airline frequent flyer program for better value. That’s because airlines price their premium tickets 5-15 times more than coach, while the mile difference is not nearly as pronounced. Let’s take one of the most popular flights between the U.S. and Europe – from New York to Paris. 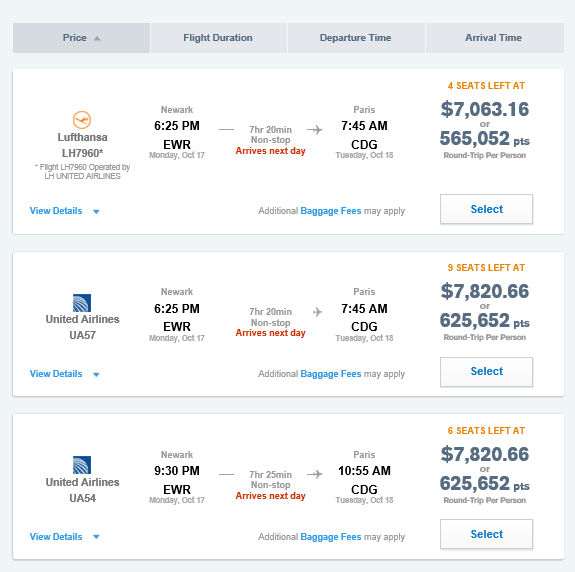 Here is what a nonstop United or Lufthansa flight would cost you in UR points. 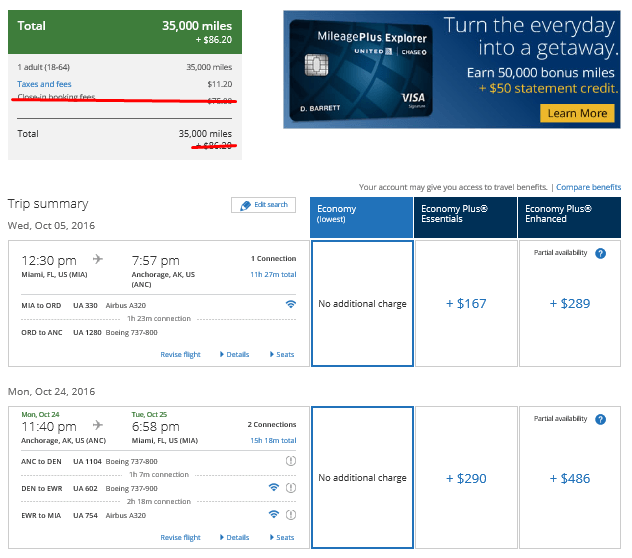 If you try to price the same or similar flight in miles on the United website, you’ll get a much better picture (if you have enough miles in your account, you’ll only pay $126.56 for taxes and fees). As you can see, the difference is striking. If you transfer the points to United, you’ll pay 115,000 points, if you book on the Ultimate Rewards website, it’s either 565,052 with the Sapphire Preferred or 470,877 with the Reserve. Of course, the price you pay on the Ultimate Rewards website includes taxes and fees, but that would only save you a few thousand miles. A huge caveat, however, is award availability, which is much harder to find in premium classes than an economy seat. It’s very important that you search for an available flight before making the transfer, or you might find yourself with the miles you can’t use on this trip.